Pixter Color Game Cartridge - Scooby-Doo! LEAP FROG LeapPad Scooby Doo and the Disappearing Donuts. This is for the video now pvd disc only, good condition light scratches. Develop Logic and Reasoning Skills. 190 Fun Lessons. Working order, ages 4-7. If you have a great experience and are happy with your item, we would LOVE for you to let us know. For use with LeapPad, LeapPad Plus Writing, Quantum LeapPad or LeapPad Plus Microphone. Scooby, Barney, Diego, Alphabet, Cars, Kung Foo Panda, Spiderman, Thomas, Winnie the Pooh. Vtech V. Smile. 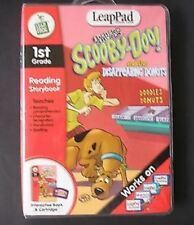 SELLING A LEAPSTER LEARNING SCOOBY DOO MATH GAME... MADE FOR KIDS 5-8 OR KINDERGARTEN TO 2ND GRADE... ITEM IS LIKE NEW AS ONLY PLAYED A FEW TIMES... FAST SHIPPING AND NOTE MY 100% RATING! Scooby-Doo and a Mummy,Too! NEW Vtech V.Reader. 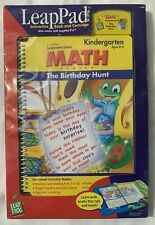 Teaches number recognition, addition, subtraction and sequencing. Jump to catch Scooby Snacks and complete the equations. Leap pad Phonics leap's friends from A-Z. Pre-Owned in good working condition. Leap pad - Leap 1 Reading- Scooby-Doo and the disappearing donuts. Leap pad Leap 2 Reading- Arthur and the lost diary. This is a Leap 1 Preschool-Grade 1 (ages 4-6). Title: MUSIC HIT IT MAESTRO! Works on Leap Pad System, Leap Pad Plus-Writing & Quantum Pad. The preschool gaming handheld that connects to the LeapFrog Learning Path, an online experience that lets you see what your child is learning. Parents can connect online to the LeapFrog Learning Path to see what their child is learning. 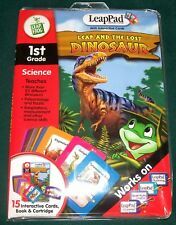 Leap Frog LeapPad PlusWriting System With Case & 4 Books. All Accessories Incl. LeapPad PlusWriting unit in pristine condition. Includes extra accessories as shown including 4 books and 2 cartridges and carrying/storage case. Includes a fresh set of batteries so your little one is ready to roll! Manufacturer: Vtech. Bob the Builder. Your patience is appreciated. Brand new factory tape sealed never opened. Just ask for a combined invoice! VTECH VSMILE VMOTION. FUNLAND FRENZY. TV LEARNING SMARTRIDGE SCOOBY-DOO! DO NOT DUPLICATE OR COPY! MATH, VOCABULARY, SPELLING, NUMBER ORDER, LOGIC, MATCHING. LeapFrog / LeapPad. Leap and the Lost Dinosaur. 1st grade Science. For 1st grade.